New York: Modern Language Association of America. 2003. Sixth Edition. Softcover. 0873529863 . Very Good in wrappers. Sticker residue to rear panel. ; 0.9 x 8.9 x 6.3 Inches; 360 pages; All domestic orders shipped protected in a Box. .
Modern Language Association of America, May 2003. Trade . 3.1 PB standard 50%. Modern Language Association of America, May 2003. Trade . 3 PB standard 50%. Modern Language Association of America, 2003-05. Paperback. Like New. Book has slight shelf wear from storage and use; otherwise the book is in very good condition. Modern Language Association of America, May 2003. Trade . 2 PB Worn -5%. Modern Language Association of America, May 2003. Trade . Good. Good Softcover. Moderate soiling and shelfwear to covers. Stickers on cover and spine. Plastic bubbling up on spine. Textblock mildly soiled. Some pages have a bent corner. Pages clean and tight in binding. Pictures available upon request. A locally owned, independent book shop since 1984. 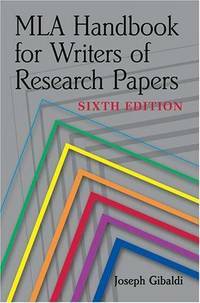 MLA Handbook for Writers of Research Papers. Sixth Edition. see notes for publisher info. PAPERBACK. B000M4T9N8 Very Good Condition. Five star seller - Ships Quickly - Buy with confidence! . Very Good. Modern Language Association Of America, 2003. Trade Paperback . Used Good. We carry new and used books in our storefront. We want you to be satisfied with your purchase. Please contact us if you have questions regarding this item. Modern Language Association of America. Used - Good. 6th Edition. Used books are NOT guaranteed to contain components and/or supplements such as: Access Codes or working CD's/DVD's! Ships fast! Expedited shipping 2-4 business days; Standard shipping 7-14 business days. Ships from USA! Modern Language Association of A, 2003. Paperback . VeryGood. A nice copy. Clean text, solid binding. Sixth edition. Modern Language Assn of Amer. Used - Good. Used - Good BOOK ONLY! 6th Edition May contain highlighting/underlining/notes/etc. May have used stickers on cover. Ships same or next day. Expedited shipping takes 2-3 business days; standard shipping takes 4-14 business days. Modern Language Assn of Amer. Used - Acceptable. Used - Acceptable SLIGHT WATER DAMAGE 6th Edition Not perfect, but still usable for class. Ships same or next day. Expedited shipping takes 2-3 business days; standard shipping takes 4-14 business days.